Almere and Flevoland are famous for the huge nature preserve that dominates the land between Almere & Lelystad. From wild horse to thousands of bird species, native Dutch wildlife can be seen in all its glory with a short trip out to Oostvaardersplassen. The story of the Oostvaardersplassen is extraordinary. In the new land, recaptured from the ocean, the organizers had planned a territory for industry. In any case, overconfidence brought the world something other than what was expected. Rather than remaining dry land, the geese kept the water open by eating all the water plants and prevented the goal of solid ground. So rather than fight Mother Nature, the Dutch decided to give the land back to her. Oost is the Dutch word for East. Vaarder is a seafarer. Plassen is place. Oostvaardersplassen is the place of the eastern sailors. Now Oostvaardersplassen is one of the world’s most important nature reserves less than 50 km from the heart of Amsterdam. There are geese and ducks by the thousands, many steeds, deer, cows, wild fowls and plants. For some feathered creatures it is the most important stop on their migration south. Sometimes the birds simply remain there for the winter. The best way to explore Oostvaardersplassen is to enter the territory from the Lelystad side; the Oostvaardersveld. There are 5 trails that all begin at the Bezoekerscentrum on the Knardijk. It is a Mecca for bicycles. Touring the entire area is a trek of around 35 km or 20 miles. A bike tour takes about 3 hours. If you are a nature lover it is extremely beneficial to bring binoculars and a camera! Following a couple of stormy days the strolling trails can be very sloppy so wear appropriate footwear and clothing. 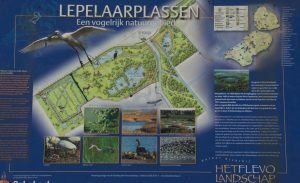 The Lepelaarplassen is a natural reserve of ​​approximately 500 hectares located on the Markermeer in Almere in the Dutch province of Flevoland. It has been a nature reserve since 1971. The area has been managed by the foundation Flevolandschap since 1994 and was designated in 2009 as a Natura 2000 site. Lepelaar is the dutch word for the bird known as the Spoonbill in English. Plassen is the word for place. Thus Lepelaarplassen is the place to see spoonbill birds. The Lepelaarplassen is basically the southern half of Oostvaardersplassen. The core of the Lepelaarplassen consists of a clay swamp with three lakes created by sand extraction during the construction of the Oostvaardersdijk. Along the dike is a fourth lake that is inhabited by a wide array of birds. In the breeding season (March to July), the birds tend to hide from bird watchers. On the Oostvaardersdijk, at the pumping station Blocq Kuffeler, is the visitor center de Trekvogel. From August to early March the Lepelaarplassen is a hikers paradise. In addition to 5 hiking trails, there is a marked 12-kilometer bike trail with guided signposts. Within Lepelaarplassen is a willow with the thickest trunk in the southern Flevopolder measuring 3.75 meters in diameter. The Lepelaarplassen, together with Wilgenbos and Oostvaardersplassen are located along the Oostvaardersdijk, a major route for migratory birds. The fields are partially connected, but fish and large herbivores can not make the crossing. According RSPB is the area of ​​the Lepelaarplassen has been designated a wetland of international importance. The area is a cormorant bird colony. Cormorants settled in 1985 with about 240 pairs and grew to 5,000 breeding pairs. But a reduced supply of fish, in particular the Markermeer, decimated the colony in the year 2014 to about 1,100 pairs. In total there are about 94 species of breeding birds, including Little Grebe, Crake, kingfisher, purple heron and the great egret since 2014. The area also has an active beaver population. In order to reclaim the land that comprises Flevoland, the Dutch had to figure out a way to first pump out the seawater, and second, keep it from coming back and flooding the land like it has for thousands of years. Cornelis Lely was the brilliant Dutch engineer who figured out how to pump the water out. The town of Lelystad is named after him. Once Lely had pumped the water out, de Oostvaardersdijk was built. Dijk is the Dutch word for a dike or dam, and Oostvaardersdijk is part of 251 kilometers of dikes that protect the ponder (land reclaimed from the sea) of Flevoland. Provincial road 701 (N701) is a provincial road in the Dutch province of Flevoland between Almere and Lelystad. The road follows the vast majority of the coastline in the IJmeer and the Markermeer. Almere, the road has a connection to the A6. Along the way the road runs along the Oostvaardersplassen. In the municipality of Almere, the road is called successively Pampusweg, IJmeerdijk and Oostvaardersdijk. In the city of Lelystad called the road also Oostvaardersdijk. So both the dike itself and the road that runs on top of it are called Oostvaardersdijk. Both the road and the dijk are beloved by cyclists, hikers, and motorcyclists. The ride from Harbor House in Almere Poort to Yacht Club in Lelystad is exactly 30km or 18 miles and follows the coastline as you ride across the top of Oostvaardersdijk. If you have the time and stamina, do it by bike. Otherwise it makes for a nice 30-40 minute car ride. De Trekvogel is an incredible place to go. It’s exceptionally instructive with a tremendous amount of information about how Flevoland was reclaimed from the sea. It also has great information about the wildlife that has been resettled into the polder. The presentations are extraordinary and the staff is very helpful There is a movie available that explains how the Dutch reclaimed the land by pumping out all the water. The movie is about 20 minutes long and is available in English, Spanish & Dutch. The volunteers and staff are extremely kind. You can have some tea or espresso for two or three euros as well as some awesome pastries and jelly made by the locals.